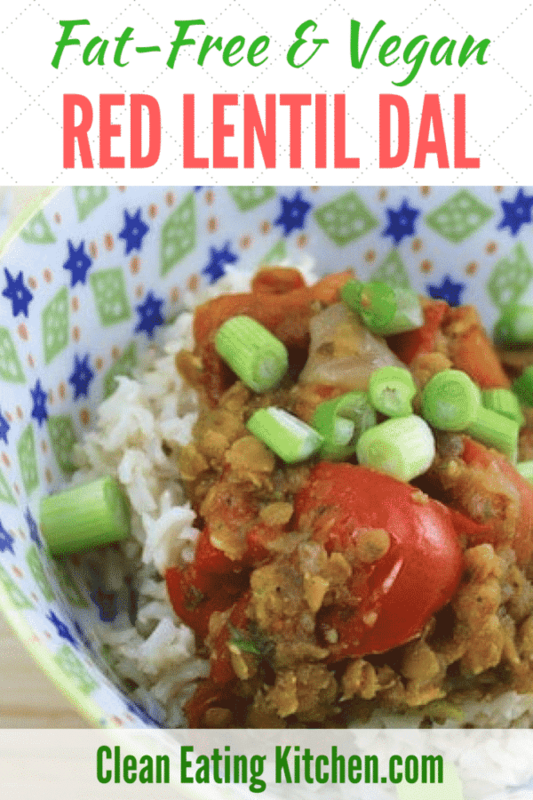 Here’s a fat-free and vegan Red Lentil Dal recipe that is easy, healthy, and delicious! 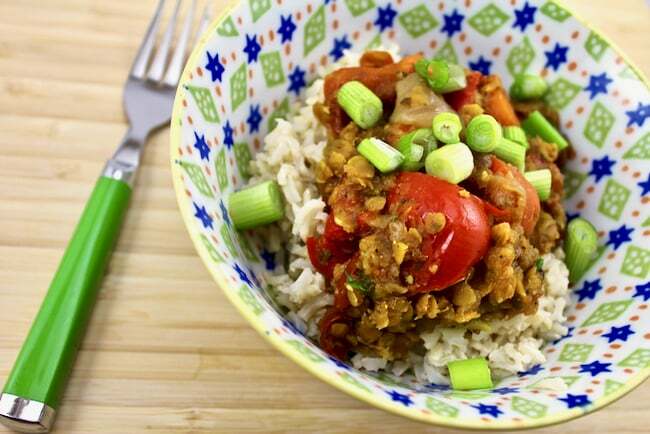 You’ll love the spicy flavors made plant-based and super nutritious. Summer is here, but that doesn’t mean we have to stop cooking. I like using the crock-pot when temperatures heat up, because it means I don’t have to heat up my kitchen with the stove or the oven. Also, just to note, you can adjust the spices according to what you have in your pantry. If you are missing one, just leave it out or add more of another. I do recommend using garam masala or curry, though, that’s what adds the Indian flavor to this recipe. 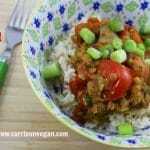 A healthy vegan crockpot dish. Chop carrots into 1-inch pieces. Chop onion and tomato. Slice bell peppers. Mince garlic. In a large non-stick skillet, heat 2 tablespoons of water. Add carrots, onion, tomato, bell peppers, and garlic, and cook over medium heat for 3-5 minutes, or until vegetables have softened. Rinse and drain lentils and pick through for any debris. 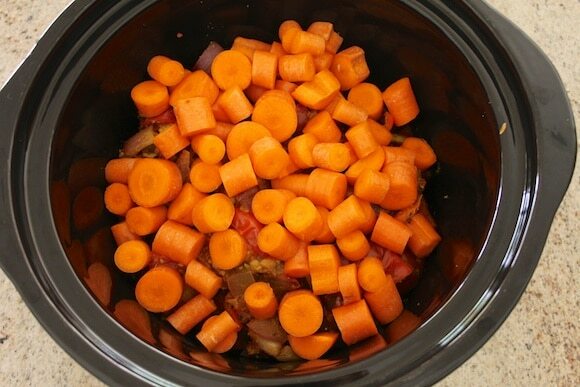 Combine carrots, onion, tomatoes, bell peppers, lentils, water, cumin, no-salt seasoning, dried oregano, turmeric, ground ginger, garam masala, and cayenne pepper in a slow-cooker. Set to low and cook for on low for at least 5 hours or until lentils are softened. Top with chopped green onions. As an option, serve over cooked brown rice or fresh salad greens with a dollop of dairy-free yogurt. 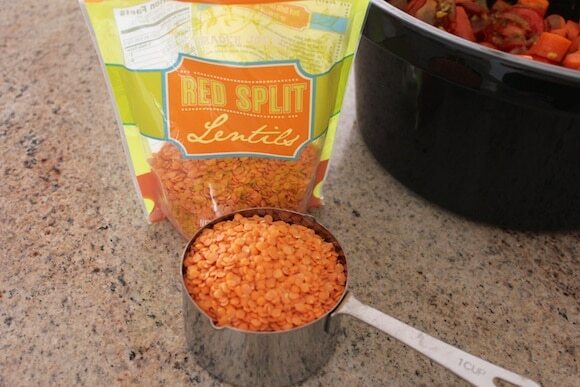 Pin this Fat-Free & Vegan Slow Cooker Red Lentil Dal recipe! Looks yum! Can’t wait to try it, thank you for sharing!! Looks delicious! 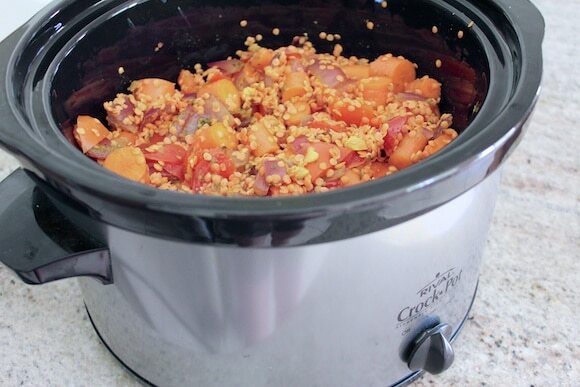 I think the crock pot is the perfect solution for summer cooking – you get the hot, filling food you want without turning on the oven or stove. Thanks for sharing! Have fun at the conference Carrie!! Thanks, Kimmy! I am really excited to have a break from school stuff and enjoy San Diego. My cat sleeps like that, too. 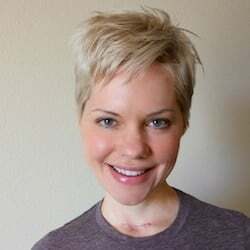 Cool, Robyn, let me know what you think! Also, btw, are you still coming to Pasadena in a few weeks? Want to try and get together? I love indian food! Smart idea to use the slow cooker too- it’s getting so hot! Can’t wait to read about the conference! I’m reading his book “Eat to Live” right now and love his views. Carrie, I totally agree about the crockpot. I’ve also been using mine a lot lately since it’s been hot. It’s usually my lazy way to cook beans so they are ready for dinner. I’ll have to start getting a little more creative by cooking your dal recipe. Love your app! I had been wanting to make dal for a long time, was so happy to find this recipe! I ended up needing to cook it for 8-10 hours instead (since I could not precook the veggies). To make this closer to my (picky) taste, I doubled the amount of garam masala and added 1/2 can of cocunut milk at the end. It was no longer fat-free, but perfect! I’m so excited about this! So simple and very little time investment. I’ve a 2 month old and my SO is working alot, so finding time to cook is challenging. Your crock pot recipes wash this huge sense of relief over me! Great recipes and smart ideas! That’s why I love following your blog.